Last year I was aghast that a losing team, the Seattle Seahawks, were in the playoffs as the NFC Western Division Champions. This year, something almost as ridiculous has happened. 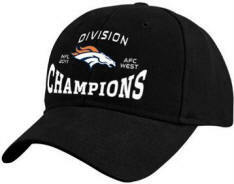 The 8 and 8 Denver Broncos, who lost in week 17, are calling themselves champions anyway. That is only a .500 record. They lost as many games as they won. Once again, I am calling for a rules change that will allow only winning teams to advance. The system I propose is perfectly simple. If no team in a division has at least a 9 and 7 record, that division should be left out. A second place team from another division with a winning record would cross over temporarily to the division that produced no post season eligible teams. In an extreme case, that team could even come from the other conference. This year, the Pittsburgh Steelers would be declared the crossover champion, getting the fourth seed and the home game that comes with it. The Cincinnati Bengals would become the fifth seed, and the 9 and 7 Tennessee Titans would get the sixth seed, rounding out the AFC playoffs. Instead of this sensible alternative, the NFL is calling The Denver Broncos a champion. I think that is a joke. I am confident that Pittsburgh will make them look like the joke I perceive them to be this Sunday. Tim Tebow can hand off the ball or run with it himself, but he is a terrible passer. All an opponent has to do to shut him and the Broncos down is to play prevent defense. That is exactly what Kansas City did last Sunday, holding Denver to nothing but a field goal.